Stormwater is excess water generated when rain falls on impervious surfaces (roofs, roadways, sidewalks, driveways, etc.) or falls too fast to be absorbed into the soil. In urban areas or other developed areas, stormwater is typically transported from the land via a storm drainage system (curb and gutter, storm drainage pipes, channels, etc.) into our streams and rivers. Stormwater begins as rain, but picks up pollutants (sediment, nitrogen, phosphorous, oil, grease, and other toxic substances) and litter in its path before entering the storm drainage system. These pollutants are carried directly to our streams and rivers. Some of these pollutants such as nitrogen and phosphorous promote algae growth, which consume and deplete precious oxygen that fish and other aquatic species require. When oxygen levels get too low, aquatic animals can be weakened and even killed. What is being done to address the problem? In December of 1997, the Environmental Management Commission adopted rules to reduce the amount of nitrogen delivered to the Neuse River Basin from point and nonpoint sources by a minimum of 30 percent of the 1995-loading rate. Wastewater treatment plants and industrial plants are considered point source discharges. 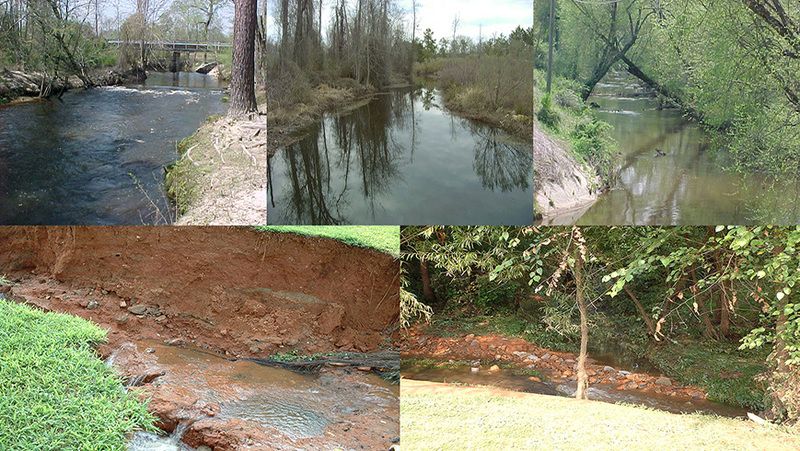 Point source discharges are regulated under the National Pollution Discharge Elimination System (NPDES) administered through the NC Department of Environment and Natural Resources Division of Water Quality. Non-point source discharges originate from rainfall or snow melt flowing across lawns, streets, parking lots, agricultural fields, forests, industrial sites, construction sites, etc. In May 1998, the Johnston County Board of Commissioners adopted the Johnston County Stormwater Management Ordinance. The intent of the ordinance was to protect streams from the secondary impacts of development. Later in 1998, the Environmental Management Commission adopted the Neuse River Basin – Nutrient Sensitive Waters Management Strategy: Basin-wide Stormwater Requirements (Neuse Rules). In those rules, Johnston County was identified as one of the 15 local governments required to adopt a Stormwater program specifically addressing nitrogen reduction. The EMC approved the revised Johnston County program in December 2000 with an effective date of March 9, 2001. 4) Protect and preserve downstream natural drainage ways. The program also seeks to mitigate impacts on surface water resources from development to the maximum extent feasible. 4) Public education and awareness of water quality issues. 4) Water Supply Watershed protection.